Peer-2-Peer fundraising is a growing trend among nonprofits. It’s becoming more diverse and efficient than ever before. Supporters are creatively tapping into their personal networks to raise support for causes they stand behind. 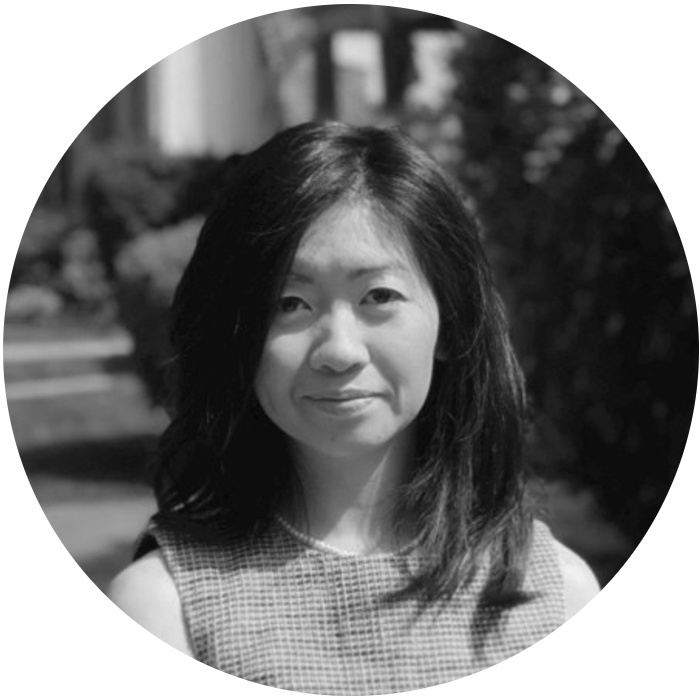 Last week, we had the pleasure of speaking with Liz Huang, Manager of Creative and Digital Marketing at The Bowery Mission. Liz discussed how P2P fundraising has grown immensely over the past 3 years at The Bowery Mission. She shares how her team empowers individuals to raise money on the organization’s behalf, resulting in 20% of their digital fundraising revenue. The Bowery Mission is one of the oldest rescue missions in the United States. Since the 1870s, The Bowery Mission has met the short-term, emergency needs of New Yorkers caught in the cycles of poverty, hopelessness, and dependencies of many kinds with compassionate care services — warm food, safe shelter, clothing, and medical care. Liz answered every question around P2P fundraising and shared helpful pro tips, check out our most recent webinar to hear more! So, what is peer-to-peer fundraising? P2P fundraising empowers donors to raise money on your behalf. It’s a multi-tiered approach to crowdfunding where individuals personally fundraise for a cause. This can feed revenue back to your organization as a whole, or to a specific campaign. This style of fundraising multiplies the reach of your organization because fundraisers have a high personal buy-in. It relies on individuals’ networks and has the potential to harness a sense of community and empower today’s donor. Pro-tip: Inspire people to participate during (or after) life events such as birthdays, graduations, a recent election, overcoming an illness, loss of a loved one, etc. Now, more than ever before, fundraising software enables individuals to design a personal fundraising page – transforming engaged supporters to ambassadors. Another trend that has evolved over the years is integrating philanthropy into public social profiles across multiple social networks. This can organically create momentum and build social proof for your campaign. P2P has become a large part of The Bowery Mission’s overall fundraising strategy. 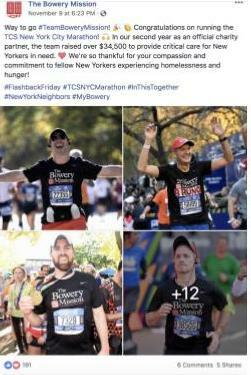 From their Thanksgiving and Evergreen fundraising events to the NYC Marathon, and separate corporate/community partners, The Bowery Mission uses P2P to interact with many channels of individuals. 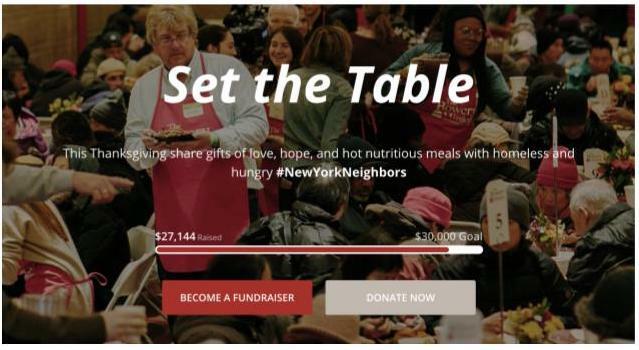 To inspire P2P fundraising, The Bowery Mission promotes via their website, social media, and one-on-one relationships with high-level donors and partners. Their website explains the concept of peer fundraising and how it can impact the men, women, and children they serve. Liz shares the importance of an easy-to-use platform to host campaigns, for both internal staff including your gift processing and marketing teams, as well as for fundraisers. On social media, The Bowery Mission primarily thanks donors and shares successes. The Bowery Mission supports fundraising efforts by providing a user-friendly campaign platform, dedicated staff, and helpful resources. This reduces friction and minimizes any barriers for fundraisers to get started. Some of their most creative and successful campaigns include Set the Table (a Thanksgiving fundraiser), NYC Marathon, and #Heplaysforme. Liz describes each campaign on the webinar, check it out here. To measure the impact of P2P fundraising, The Bowery Mission ultimately focuses on revenue as the key metric. Lastly, Liz offered three pro tips to ensure successful P2P campaigns. But we don’t want to spoil it all here – go check out the webinar for yourself! When nonprofits, like The Bowery Mission, implement a carefully planned P2P strategy, they reap the benefits of emotionally invested supporters. P2P fundraising is a great way to expand your reach to untapped networks and grow your organization by inspiring donors to make a tangible difference. We‘d love to help your team develop a P2P strategy and we’re offering a free 30-minute consultation to get you started today.